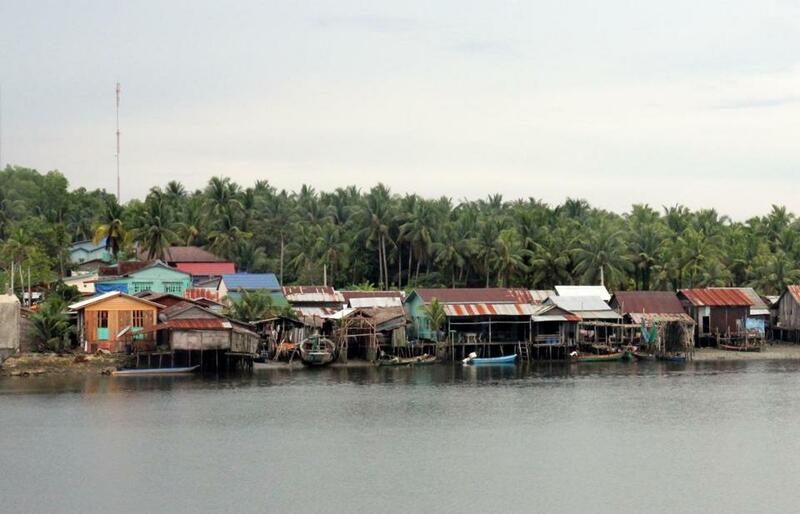 Houses line the Piphot River between the Cambodian villages of Chi Phat and Andoung Teuk. The province is trying to move toward a productive and more ecological economy. CHI PHAT, Cambodia — From a village at the edge of the jungle, the thumping bass that emerged just after sunset was not what I had expected. As I relaxed on the porch of my riverside bungalow, anticipating my bike trip the following morning, the Cambodian pop that echoed through the trees was a reminder of the night’s coming festivities. Shortly after I had arrived that afternoon, skidding into town on the back of a hired motorbike, a local groom-to-be named Veasna Chan had invited me to his wedding. Apparently it was time to start the party. I dug out the least crumpled shirt from my backpack and followed the sound with Lee Heng Som, manager of the Sothun Lodge, where I had checked in for the evening. Crossing a rickety footbridge, we walked a few minutes up a dirt road and arrived at the home of Chan’s bride, Sok: a wooden dwelling perched on stilts inside a yard of banquet tables bathed in floodlights. As women in colorful traditional dress arrived to greet the couple, Som and I sat down with a table of other young men. Soon we were toasting to rounds of Angkor beer, served on ice. Despite an early morning ahead of me, I relished the night as food and drink gave way to dancing — well aware that as a visitor to Chi Phat’s Community-Based Ecotourism (CBET) project, I was lucky to be part of the spectacle. For decades, this village at the edge of Cambodia’s Southern Cardamom Mountains had effectively been closed to the outside world. From 1975 to 1979, during the reign of Pol Pot’s Khmer Rouge, Chi Phat was home to a brutal forced labor camp; for 20 years after the regime’s fall, Khmer Rouge soldiers continued to lurk in the surrounding forest. In an atmosphere of insecurity, ecological damage was rife. In the 1980s and ’90s, commercial logging outfits wiped out much of the Cardamoms’ virgin rain forest, while slash-and-burn farmers and artisanal loggers destroyed more. Fueled by demand from Vietnam and China, poachers scoured the jungle for globally threatened species like the Asian elephant, Indochinese tiger, Sunda pangolin, and Malayan sun bear — with several animals targeted for their alleged medicinal or virility-boosting properties. Over the last decade, however, the prevalence of destructive activities has decreased, thanks to stepped up law enforcement and several conservation initiatives led by the US-based nonprofit Wildlife Alliance (formerly Wild Aid) in collaboration with the Cambodian government. Though an important step for conservation, the crackdown on logging and poaching left many families without livelihoods, a conundrum that eventually gave birth to the CBET project. Since its launch in 2007, the venture has worked to convert former hunters into guides and villagers into guest house proprietors, while offering visitors the chance to hike, bike, or kayak into what is now the Southern Cardamoms Protected Forest. Managed by Chi Phat residents with technical and financial support from Wildlife Alliance, the initiative is making progress. According to de Martimprey, this year’s January-February high season drew approximately 300 visitors per month, a 30 percent increase from 2011. In addition, 172 of Chi Phat’s roughly 500 families now earn income from tourism. For visitors, the draws of a trip to Chi Phat are many, including the chance to explore one of Southeast Asia’s largest tracts of rain forest. Though grateful for the invitation to Chan’s wedding, my real adventure began the following morning, as I set off on a Trek 4300 mountain bike with a team of local guides: Sarmain Chan, a middle-age former logger, and Vanak Tuy, 20, a recent high school graduate. Following a dirt road out of town, we passed waving schoolchildren and rows of stilted houses before reaching a narrow path that led us to the jungle. Over the next several hours we pedaled over rugged uphill terrain, avoiding overhanging vines, fording leech-infested rivers, and stopping to explore a bat cave and multiple waterfalls — all through oppressive 100-degree heat. By the time we reached our destination — a ledge of ancient ceramic jars thought to contain the remains of Cambodian royalty — I wanted little else but water and sleep. Luckily, our campsite lay a mile or so back along the path. A covered bamboo platform at the edge of a small river, it had been partly damaged by an elephant, yet still proved a suitable base for an afternoon of swimming and lazing in a hammock. After an early dinner around the campfire, the sounds of the jungle night were upon us. Gibbons hooted, piercing a din of cicadas as loud as table saws. Giant hornbills soared above the treetops, creating a whoosh that ricocheted off the forest floor. Aside from a group of men that passed on motorbike — just before the clouds unleashed a violent thunderstorm — signs of human life were absent. We awoke the following morning to a breakfast of grilled fish before retracing our route back to the village. Though I had expected the downhill ride to be easy, the track was slick from the previous night’s downpour, and on multiple occasions I found myself careening into the underbrush. By the time I arrived at the home of Samnang Khem, where I had arranged to spend my final Chi Phat night, I was caked in mud and covered in cuts and bruises — and headed straight for the bucket shower. Like several Chi Phat families, Khem and her husband, Saroeurn Chan, keep a room in their powder blue house that is available to CBET travelers for just $3 per night. Though the couple’s English was limited, their daughter Sag, 11, was happy to translate, while playing the role of homestay concierge. Thankfully, the night’s entertainment would not involve drinking and dancing — though music would again be on the agenda. Following a dinner of omelet, rice, and stir-fried wild mushrooms, Sag emerged with a video CD of Cambodian pop hits, including several songs I recognized from the wedding. New to me, however, was Sag’s favorite: a track performed in a mix of English and Khmer. I didn’t — though somehow, in a village reborn by opening to the outside world, the title seemed appropriate. Jon Rosen can be reached at jon@jonrosen.net.